Most people I know in business want to help others. Particularly if you're in the health space. That’s why we got started, isn’t it? Because we have answers to problems, and it drives us crazy when other people struggle and don’t know about the solutions. It's no good if people don’t know about what you do: the 2000 year old admonition of "not hiding your light under a bushel" comes to mind. Which is where the power of marketing - ethical powers of persuasion - comes into play. I know of SO many great Integrated Health and Functional Medicine professionals, for example, who most people have never heard of. If you're not in business or not an entrepreneur or an active affiliate, this post isn't for you, so stop reading now. But if you are ... I have just the thing for friends looking to TRANSFORM business revenue in 2019. My business-building friend Russell Brunson is one of the best in business. His own company is worth more than $500M and he’s helped more than 500 people each do more than $1M in revenue - including providing huge support to charities. In fact, he recently raised over $1M for the brilliant Operation Underground Railroad charity in just one day. 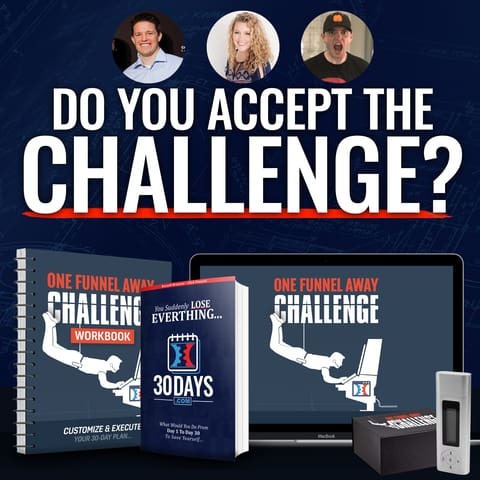 Russell's “One Funnel Away Challenge” is the best business training condensed into 30 days. The deadline to join is 9pm on the 24th of this month - this weekend! - because the Challenge starts on the 25th and lasts for 30 days. If you're in business and you don't know, you definitely need to take this Challenge? A "marketing funnel" helps consumers - customers, clients, patients - understand how you can help. It's the fastest, easiest, most cost effective way to make sales in your business or simply collect leads (prospective consumers) because every sale, every time you help someone, that someone starts as a "lead". Russell says, "The Life You Want, The Marriage You Want... The Family That You Want ... Are All Going To Be Fuelled By The Business You Build..."
I'll add to this: The Impact On The World You Want To Make. The One Funnel Away Challenge is brilliantly done and totally fits with our own Making More Impact (MMI) program. MMI is all about Making More Impact, transforming your business revenue without working ridiculous hours, so you Make More Revenue And Give More To The World. 10X your Impact so you, your family, community, and our shared planet all prosper. I and my team love to look after the Good Guys, which is why in addition to “Get Your Boom! Back” we work with a small number of businesses who are Humanity+: positive for people, planet, and profit for good. Right now, you’d be crazy not to take part in the One Funnel Away Challenge for only $100. When you sign up for this One Funnel Away Challenge for 30 days (deadline Sunday 24th February, 9pm EST), I'm going to INCLUDE you in our private Making More Impact (MMI) group, with our other students and clients. It’s a brilliant community with tons of support, so you actually get things done. (More about it here makingmoreimpact.com). Normally this is only available to business-owners who have completed our full $10,800 MMI program and costs $197/month. But Get Your Boom! Back is going to give this to you when you sign up for Russell’s program, which only costs $100. But only before the deadline, Sunday 24th February 9pm EST. AND we’re going to give you access to the ENTIRE training inside Making More Impact, which normally costs $10,800! Everything you need to know to transform your business - what to do, how to do it, who to help you. AND one of our coaches, Rob in the northern hemisphere or Tom in the southern hemisphere, are able to get on a call with you to see what you need help with first. All for a one time payment of $100. Even though Russell’s program is brilliant (I was a speaker at a recent Marketing Summit with some of the people contributing, so know they are the real deal and have generated millions of dollars in sales), over 90% of the people who take part in the One Funnel Away Challenge probably won't succeed and see it through UNLESS they're in a small personal accountability group like MMI. So the two work really well together.